Fifty-seven miles of rustic carriage roads weave around the mountains and through the valleys of Maine's Acadia National Park on Mount Desert Island. John D. Rockefeller Jr., bought a summer home at Seal Harbor in 1910. He dreamed of an elaborate system of horse roads and granite bridges to provide access for horse drawn carriages on the island. He knew that with the passing of his generation, the automobile roads would overwhelm America's National Parks and the carriage roads would slip quietly into the history books. Between 1913 and 1940, he worked with the National Park Service to create an elaborate 57-mile system of auto-free horse roads on 15,000 acres of Mount Desert Island's most scenic terrain. He then donated the roads to Acadia National Park for park stewardship. When he died in 1960 the dream faded but was revitalized in recent years to produce a major carriage road renaissance. The carriage roads are broken stone roads, a type commonly used at the turn of the century. They are approximately 16-feet wide, constructed with methods that required much hand labor. Engineered to contend with Maine's wet weather, three layers of rock, stone culverts, wide ditches and a substantial six to eight inch crown ensure good drainage. Breast walls and retaining walls were built to preserve the line of hillsides and save many trees. Rockefeller aligned the roads to follow the contours of the land and to take advantage of the scenic view. 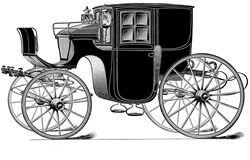 He graded the roads so they were not too steep or too sharply curved for horse-drawn carriages. Large blocks of granite line the roads, serving as guardrails, employing a crew of foresters to remove debris from the roads and roadsides. He financed 16 stone-faced bridges, each one unique in design, to span streams, waterfalls, roads and cliff sides. The bridges are steel-reinforced concrete, but the use of the native stone for the facing gives them a natural appearance. The stones serving as a guardrail are roughly cut and spaced irregularly to create a rustic appearance. Rockefeller's road building techniques and skills came from his father, John, Sr., the founder of Standard Oil. He built and landscaped carriage roads on his Ohio and New York estates. 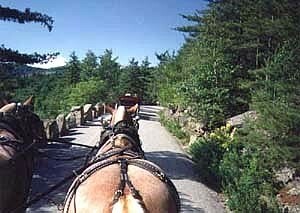 The Acadia National Park carriage roads have been included in the National Register of Historic Places in 1994. Members of the American Driving Society came to Acadia from 24 states with their horses and carriages to drive "Mr. Rockefeller's Roads" and properly celebrate the Park's carriage road renaissance in 1994. The roads today are managed by the National Park Service to provide the intended slow-paced experience where park visitors can totally escape the automobile.